To pick the best windows for energy saving you have to consider your local climate. In Maine your windows will drop your energy cost if they allow the sun’s light to heat up your home and help trap that heat inside. Air conditioning isn’t your energy problem. In Florida it’s quite the opposite. You might have a few days each year when you enjoy feeling the heat of the sun taking the chill off the wintery morning, but the best windows for energy saving here need to stop heat flow. They need to keep heat out in the warm months and hold heat in on those days when temperatures drop. When you put your hand on your aluminum framed windows in the winter and feel that chill, it’s the heat of your body moving toward the cold metal. Heat moves to cold, not cold to heat. That’s the scientific principle that allows the Sun to warm the Earth. You feel cold as heat is drawn away. So if you are sitting on your couch on a wintery night and feel cold through your single pane aluminum windows, you are experiencing the heat of your body and the heat in your room rushing toward the cold night outside, nothing stopping it. So the best windows for energy saving in Florida will have to stop heat from entering your air conditioned house in the warm days and stop heat from leaving when it’s cold. Most folks are becoming familiar with Energy Star. Their ratings will tell you about energy efficiency, helping you to make wise choices when you buy products that can influence energy saving. Take a look at their map of the US when it comes to the best window for energy savings and they have different zones with different needs, another clue that a window that works well in one region might be the wrong choice for your Florida home, especially in the Tampa Bay area where we very rarely see freezes. 1) Look for vinyl framed windows. Aluminum conducts 1416 BTU’s per square foot per hour, vinyl conducts 1.3. If those frames are foam enhanced, they’ll perform even better. Avoid wood framed windows. Here in Florida we have moisture in our air 24/7 so wood can never completely dry out. Even high end vinly or aluminum clad wood windows fail and rot here. I’ve seen plenty! 2) Choose a high performance low emissivity glass, Low-E. Not all Low-E works the same way though. Some are designed for up north to allow the sun’s heat in and trap it. Cardinal, one of the largest manufacturers of heat reflective glass has region specific glass, has the best on the market for Florida, their Low-E 366. Windows with an energy star rating will show the SHGC, or solar heat gain coefficient. Duke Energy says you should look for a .30 or lower. 3) Tint will only help by reducing the amount of light that enters your home. If you have a 15% tint, you will have about 15% less sunlight coming in, hardly noticeable. Some applied films can contain a degree of Low-E, but never put an applied film on double pane glass. It will likely void any warranty you may have and will certainly help accelerate seal failure. 4) The air space between your two panes of glass gives maximum ability to insulate if there is 5/8” of space. So if you choose glass that has 2 panes of double strength, or 1/8” thick glass, the entire glass thickness should be around 7/8”. By the way, not all double strength glass is equal density, just equal thickness. The density can be evaluated by looking at the actual weight of the glass per square foot. You can find some around 10 ounces per square foot and others as heavy as 19. Obviously, the denser, the stronger. 5) Our air has the ability to insulate, but replacing the air that is between your glass panes in an insulated glass unit with argon gas, a natural non-harmful element, will boost the window’s ability to stop heat from being conducted through the glass. 6) Look for a spacer system, the place where the glass panes are separated at their edges where the insulated unit is joined, that has minimal metal. Metal is a conductor of heat. Another benefit on a non-metal spacer system is the reduction of seal failure potential, a huge problem with insulated windows here in the Tampa Bay area. I know it seems complicated. Finding the best windows for energy savings is made easier by learning how the windows are manufactured. Energy Star ratings are also a big key. 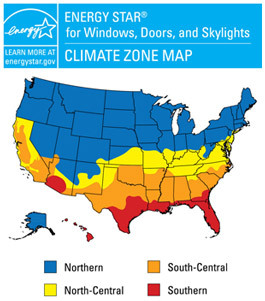 Some windows sold here in Florida are energy Star rated, but not for the Southern US! Examine the Energy Star Map and look at the U Factor and SHGC. You can also ask your electricity provider like Duke or TECO for their guidelines.